Year-round, Zurich airport is a Mecca for aviation enthusiasts. During the last week of January however, hundreds of aircraft photographers and spotters brave the ice and snow and fill the airport’s spectator terraces to capacity. For five days, scores of rare and exotic aircraft operated by governments and worldwide corporations converge on the city. Their passengers are attending the annual World Economic Forum (WEF) held in Davos, Europe’s highest town, located just 30 minutes by helicopter from Zurich Airport. The WEF was founded in 1971 as a non-profit making independent foundation committed to improving the state of the world through dialogue between the powerful. The annual meeting is attended by businessmen, politicians, religious leaders, trade unionists and high-profile campaigners. The five day conference consists of workshops, lectures and discussion groups covering a wide variety of issues. The forum provides a talking shop away from the media spotlight for leaders not often seen together in the same place. For the aircraft enthusiast, the prospect of so many politicians and business leaders arriving at one airport at the same time is mouthwatering. Zurich, the closest airport to Davos, is renowned the world over for its facilities for spotters and photographers and for its understanding of those who watch aircraft. The airport operator, Zurich Unique, proves during the week of the WEF that this reputation is well deserved. In addition to extended opening hours for the observation deck on the Saturday of the WEF, the airport provides a facility to enthusiasts unlikely to be offered anywhere else during such a high profile event. In conjunction with a well-known local aviation publisher and bookseller, the airport runs a series of specialist photographic tours during the forum. Demand is so great that the tours often sell-out well in advance of the week of the WEF. In 2009, a total of 24 two-hour tours were scheduled over a period of six days, with an incredible 6 slots being arranged for Saturday 31st January. Each tour can accommodate up to 45 participants who don high-visibility jackets and board a bus which travels each of the ramps. The bus stops as appropriate and a closely marshalled stream of photographers capture the host of exotic aircraft parked up for the duration of the forum. Each of the tours is lead by an expert guide and the enthusiasts are kept away from active taxiways and other prohibited areas by a team of burly stewards. There are few restrictions on what can be photographed with the understandable exception of shots taken while passengers are embarking or disembarking. Spending hours on an external observation terrace in Zurich in late January is a test of endurance and the efficacy of thermal underwear. The attraction however is overwhelming. Corporate jets start arriving in Zurich several days before the WEF. In addition, many attendees arrive for just one or two days of the meeting before leaving again. The volume and demand for parking is so great that many aircraft deposit their passengers and disperse to Geneva, Basle, Dübendorf, Milan or Munich for the duration before returning to collect their high profile cargo. As a result, each of the days of the conference sees a steady stream of executive and government movements. Understandably, the Fixed Base Operators (FBOs) are kept very busy looking after the huge number of aircraft and arranging for transfers to and from the conference venue. As a ready alternative to road journeys, many participants use one of the fleet of helicopter shuttles to reach Davos. Additionally, the most high profile (usually political) visitors are ferried to the forum by helicopters provided by the Swiss Air Force. From Airbus A319CJs from Armenia, Azerbaijan and India, to a whole host of Boeing Business Jets (BBJ) through an Embraer Legacy of the Brazilian Air Force and three Ilyushin IL-62Ms, a single Ilyushin IL-96 and Ilyushin IL-76 of the Russian Government, WEF 2009 provided some impressive and photogenic aeronautical visitors. 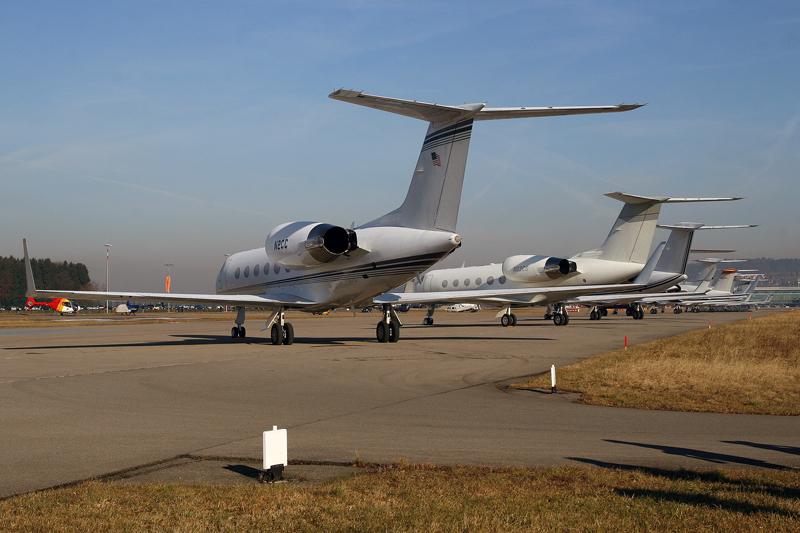 Over 1,000 business leaders arrived in literally hundreds of corporate jets of all sizes and marques. Despite usual grumbling from seasoned veterans that the range of government aircraft was again disappointing, there remained several surprises and rarities. Whilst predominantly dry, the clouds remained resolutely grey and unmoving throughout the duration of the forum leading to even more vocal grumbling from the massed photographers! It is quite clear why the week of the WEF draws so many aficionados to Zurich in spite of the often sub-zero temperatures. The airport operator understands aircraft enthusiasts and accommodates them in large numbers with a refreshingly enlightened approach. It should come as no surprise that so many of us take advantage of these facilities year after year.